is a senior research fellow in cognitive and evolutionary anthropology at Durham University in the UK. His latest book is Speaking Our Minds: Why Human Communication Is Different, and How Language Evolved to Make It Special (2014). ‘If you could say it in words, there would be no reason to paint.’ These words are attributed to the realist painter Edward Hopper. Few can paint like Hopper could, but all of us can relate to the feeling that words are sometimes not enough. Having said that, what makes images any better? Words are, after all, incredibly versatile things. Even one as supposedly simple and unambiguous as, say, ‘rain’ can be used to suggest a multitude of meanings, an infinity of implications. As part of a conversation about my mood, the exclamation ‘Rain!’ can mean something like: ‘Even the weather is bringing me down.’ If, on the other hand, I am making plans for the day, the statement ‘Rain!’ could instead suggest that I should take an umbrella with me. And then there’s metaphor and simile and irony. Ordinary communication is replete with figurative, non-literal word use. Juliet is the Sun. Time is money. Cognitively minded linguists have documented in detail how metaphor, among other types of figurative expression, is so pervasive in everyday language that we usually don’t even notice it. Societies are not biological organisms, but you wouldn’t know it from our everyday language. We talk of social afflictions, of a plague on society, of the body politic, and of how we should give our nation a shot in the arm. The examples are endless, and this expressive flexibility is powerful. How is painting, or any art form, going to do anything that language can’t? To answer this question, we need to look at human communication in the round. Damn right it is. Even something as supposedly literal as ‘The next train is at 12 o’clock’ could be interpreted in a figurative way (‘Things are really organised and efficient here!’). The technical term is underdeterminacy: my words underdetermine my meaning. And the same is true of other, non-linguistic means of expression. We shrug and point and grunt and scream. Sometimes these behaviours are idiosyncratic and highly context-dependent. Others, like a nod of the head, can be as conventional and formulaic as words are. There are also many partly conventional, quasi-linguistic cases, such as ‘Yuk!’ and ‘Ow!’, or winking to indicate a light-hearted implication. The recent cultural success of emoticons and emojis is built on such cases, and here too, as with language, there is no fully determined, formal system of coding and decoding. It’s not just language that is glorious chaos – it’s human communication in general. Some people have the intuition that we bridge this gap between what is said and what is meant by first interpreting signals as literally as possible, and then, only if that doesn’t make sense, we might consider more supposedly elaborate interpretations. However, this doesn’t fit with the data. Reaction-time experiments, for example, show that people are no slower to comprehend figurative than non-figurative expressions. Non-literal means of expression are not some sort of bonus add-on, requiring more advanced cognitive and linguistic skills to those employed in supposedly more quotidian cases. They are part of the very fabric of human communication. The big picture is this: human communication is a family of different means of expression, each with their own strengths and weaknesses. A train timetable, an anecdote, a metaphor, a point, a raised eyebrow – and even painting, too: looking at these examples, it is easy to see contrast, but for a more sophisticated reading we should recognise the familial resemblance. Some means of expression are less common than others, but they are all part of the same family unit. This family’s DNA is made of intentions. Every time we speak (or shrug or point), we have intentions to do nothing less than to change our audience’s mental life. If, for instance, I tell you that the password to the secret party is ‘fidelio’, my intention is that you believe that the password is fidelio. And you, for your part: you recognise that I have this intention. You don’t have to satisfy it, of course: you don’t have to believe me, and if you don’t, then my intention is not satisfied. But either way, I intend that you believe that the password is fidelio; and you recognise the very same. Human communication is, ultimately, all about the expression and recognition of intentions. The origins of this way of thinking about human communication are usually traced to the work of 20th-century philosopher of language Paul Grice. Grice’s picture, the main focus of which was meaning (rather than communication), has since been much discussed, elaborated, modified, and improved upon, not only by other philosophers but also by cognitive scientists, linguists, and others too. Here is an experimental illustration of how fundamental intentions are to human communication. If a child asks for a toy, but that request is satisfied only fortuitously – in other words, if the adult misunderstood, but the child coincidentally obtained the toy anyway – then the child will correct the adult’s misunderstanding nevertheless. What this shows is that the child’s intention is not simply to affect the adult’s behaviour (to get the toy), but rather to get the adult to believe that the child wants the toy. Human communication is about getting other people to recognise what intentions you have with regard to their own beliefs. The child does not simply want the toy; the child wants the experimenter to believe that the child wants the toy. Sometimes the content of our intentions is quite precise, like the fact that the child wants the toy. Other times we want to invite a more open-ended interpretation, a loosely defined family of interpretation. Newly checked into a seaside hotel, I might look out of the bedroom window and, impressed by what I see, simply look back towards my partner, and nod in the direction of view, perhaps raising my eyebrows at the same time. My actions are not much more than a prod of engagement. I want to create an impression, but I don’t wish to constrain my partner’s interpretation any more specifically than that. In the jargon of philosophy, the implicatures of my nod are only loosely constrained. This open-endedness also occurs in linguistic communication, such as when Romeo tells us that Juliet is the Sun. Ordinary human communication ranges over a continuum between the definite and the indefinite, the precise and the loose. We should not pretend otherwise. This all makes communication an inexact art. We are expressing and recognising intentions, and the content of these intentions might be more or less precisely defined. 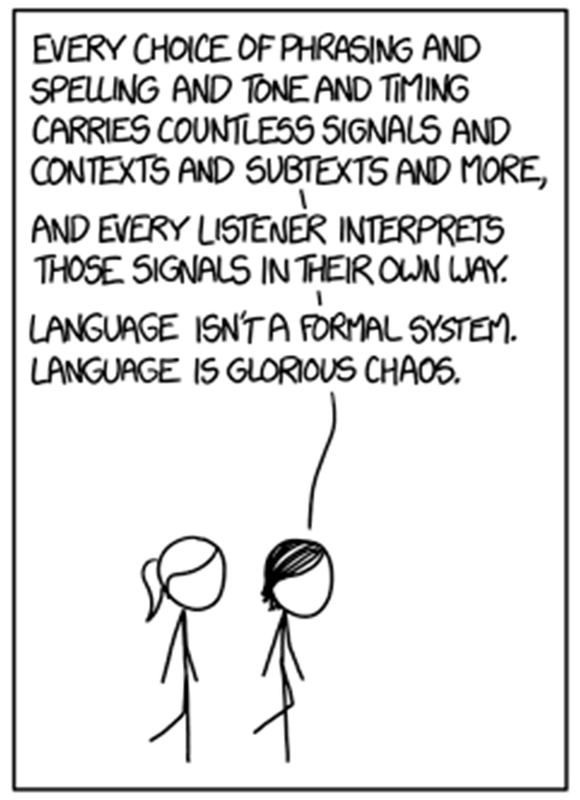 The web comic xkcd again: ‘You can never know for su­re what any words will mean to anyone. All you can do is try to get better at guessing how your words affect people, so you can have a chance of finding the ones that will make them feel something like what you want them to feel.’ Our words and points and shrugs and screams: they are all just clues about the sort of inferences we want each other to make. The best we can aim for is that they are useful clues. Speakers provide evidence, but not proof. Listeners must infer. Good evidence is that which hits the sweet spot between efficiency and perspicuity. Minimal yet clear. This is what relevance is. Give too much evidence, and you will waste energy, and bore your audience. Yes, OK, I get it! Move on! But give too little, or the wrong type of evidence, and your audience won’t be able to follow you. Cleverly designed psychology experiments have shown how audiences actually assume that what speakers say or do is relevant in this way. When approached in the street and asked for the time by somebody who says that he has an appointment soon, people will give a round answer (eg, ‘a quarter to 3’) if the appointment begins between 15 and 30 minutes hence. But if, instead, the appointment is within the next 15 minutes, then they will give a precise time (eg, ‘2:47’). In this way, a subtle awareness of the context in which their words will be interpreted actually affects what speakers say. They assume that the information given about the time of the appointment is relevant, and adjust their answer accordingly. The most common means of human communication is language, and for good reason. Languages are sets of conventions, and conventions are convenient. It’s convention that, in English, feline animals are referred to with the word ‘cat’ (instead of, say, ‘chat’ or ‘tac’ or ‘dog’). It’s also convention that we add an ‘s’ to the end of third-person verbs in the present tense (I think, you think, she thinks). We can do a lot with grunts and points, but we can do so much more when we add conventions to the mix. I can point with my arm to any of the objects in this room, but with conventions I can refer to any object in the world, and even to objects with no material existence, such as unicorns and free lunches. Linguistic conventions are how we expand, on a huge scale, both the precision and range of human communication. Still, all means of expression have their weaknesses as well as their strengths, and words are no exception. They have two major downsides. First, while certainly convenient, conventions are also second-hand. They are not the thing itself: they are a placeholder for it. A representation. This indirectness is the very point of them, but it also makes conventions less immediate than other, less mediated means of expression. If, for instance, I want you to know just how cute cats are, I could say: ‘Cats are cute.’ But it would be better, would it not, if I just showed you an actual cat? As a way to trigger in you an appreciation of their cuteness, visual experience of cats is much more effective than words could ever be. This is why YouTube is full of kittens, but the annals of literature are not. This is the difference between saying and showing. If I want you to hurry up, I could tell you that we’re already late, but if I hold up my watch I can instead literally show you. This is the more direct option, and can be more real as a result. Grice made this distinction graphic with a thought experiment involving the beheading of St John the Baptist. Salome wants to know if John the Baptist is dead. John is indeed dead, for he has been beheaded, and Herod communicates this to Salome by holding up the severed head. Herod shows Salome that John the Baptist is dead. No words are needed, nor any other type of indirect evidence. This brings us to the second downside of the indirect nature of words: they make it trivially easy to lie. Herod could have told Salome that John is dead, but why would Salome have believed him? The story comes from the New Testament, Mark 6. Herod was somewhat afraid of John, because he believed that John had already risen once from the dead. He ordered the beheading only because he did not want to break his promise to Salome to give her anything she desired. So Herod had motive to deceive, and Salome had reason to doubt Herod’s word. The whole point of conventions is to stand in for something else, but this necessarily means that the audience has to be on guard. Why should I believe this? It’s just a placeholder. Deception is possible with showing too, of course – perhaps Herod just found someone who looks like John, and beheaded him instead! – but showing carries less uncertainty. When you show me something, I can rely on the evidence of my own eyes to assess whether or not it’s true; but if, on the other hand, you just tell me, then there are several other factors I have to consider, some of which might have important unknowns. Is the person trustworthy? Does he know what he is talking about? What are the pros and cons of a false positive? A false negative? This is a more uncertain route to evaluation. In all, the indirectness of language is both its biggest strength and its biggest weakness. Conventions bring convenience, flexibility, and a fair degree of precision; but they also give a certain distance, and demand a certain vigilance. Language is not the only tool with which to express yourself, and sometimes not even the best one. One feature of artistic expression that is distinctive is its potential for relative permanency. Paintings and writings last, in a way that other means of human expression – in particular spoken words – just do not. This means that the audience does not – cannot – have a subtle awareness of the context in which the artwork was produced. Remember the telling-the-time experiment? People assumed that the time of the appointment was relevant, and that is why they were more likely to give an exact answer if the appointment was very soon. That sort of detailed adjustment of interpretation just isn’t possible with, say, a 500-year-old painting. An important part of the job of an art historian is to describe the context in which a piece was produced in some detail, and hence use that knowledge to guide interpretation. In other words: to do in a slow and deliberate way what we do quickly and easily in everyday communication. This commitment to specificity is not, it should be said, a necessary feature of realist painting. Like my nod towards the pretty view, a painting might, instead, aim only at an impression. Hopper aimed at a greater degree of exactness, and in this respect he was moving against major trends of the time, which were away from anything that could even be exact, and towards abstraction and polysemy. Viewers were encouraged to entertain multiple and sometimes wildly different interpretations, even mutually contradictory ones. It is in these ways that art has advantages over language. Realist or abstract, art can show, and at the same time, it can invite and allow open-ended interpretation in a more unbiased way than words typically do. It is easy to believe that languages are the pinnacle of human expression, but this is a mistake. Languages are indeed amazing, but so too are other means of human expression.